A Warm Welcome in Austin! We are happy to announce that all of the kids in our China Orphan Hosting program have arrived safely! 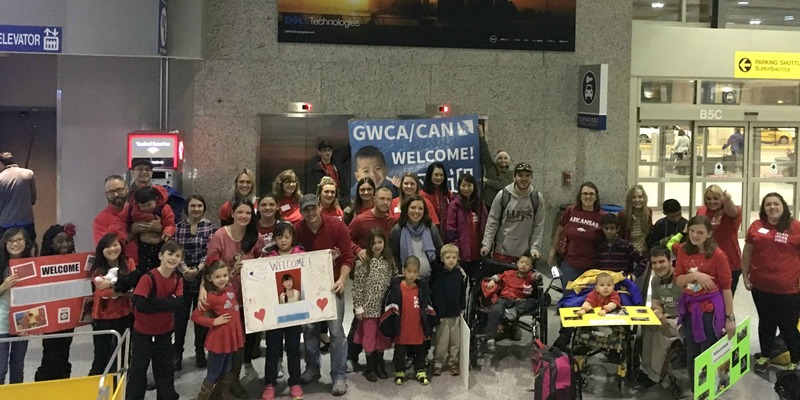 After a long day of traveling, our last group of host kids made it to Austin, TX late Thursday night, where they received a warm welcome from both their host families and GWCA staff members! This is the very first time that a hosting group has flown into our hometown, and it was such an amazing opportunity for us to meet the children and families who are participating in our Orphan Hosting program. Throughout this hosting program there will be children living with host families all across the United States. This program will give each child the opportunity to know the love of a family with the hope that they will soon have one of their very own. While some of the families in our Orphan Hosting program have already decided to begin submitting their adoption paperwork, others have joined the program with the intention of advocating on behalf of their host child with the hope that another family will step forward to bring them home forever. Every year our advocate families blow us away with their dedication to helping their host child find a Forever Family. They create advocacy Facebook pages, they engage with their communities and they spread the word about their host kiddos, providing potential adoptive families with a wealth of information that is generally not available when adopting a child who hasn’t been hosted. If you’re interested in adopting one of that host kids that’s currently being advocated for, visit our advocacy page to see their profiles, or contact our hosting coordinators today! Over the course of the next four weeks there will be host kiddos living with families all across the United States! Every family’s journey is unique, and we absolutely love following them through photos, videos and blog posts! We will be sharing updates throughout the hosting process, so be sure to check back at our blog regularly!